All about circular at JACQUEMUS ss16 #PFW. 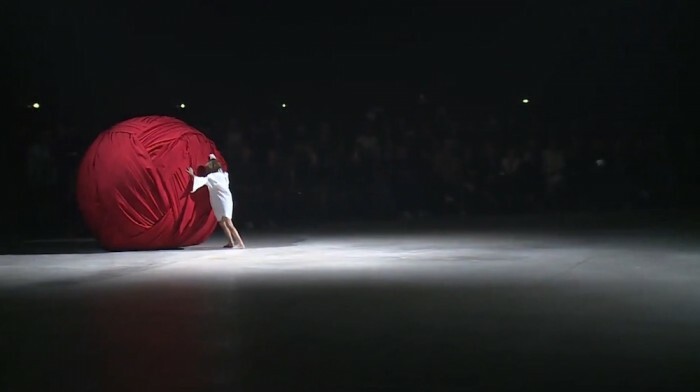 Starting with a model rolling ball at the show, young designer Simon Porte Jacquemus delivered a litle mystery for this season. Focusing on deconstructing a men’s jacket… cut, worn on one shoulder, on the hips, assembled on the body like a puzzle, the silhouette reveals a sensuality. Jacquemus is the winner of the coveted LVMH prize, and this creative young talent made himself the new little prince of fashion! A show where the designer actively takes part, walking side by side of a white horse. 🙂 The roundness is is flaunted with of 3 big balls that cover 3 models and one red ball held by a child. cute! here’s a peek 🙂 Jacquemus ss16 PFW commentary brigitte segura. more PFW | MFW | LFW | NYFW on zine.